The writer of the classic sports favorites Rudy and Hoosiers, Angelo Pizzo wrote the screenplay for his directorial debut based on the book Courage Beyond the Game: The Freddie Steinmark Story by Jim Dent. The difference between his earlier work and this one is the strive to make it totally accurate and not just "based" on real life. Pizzo used former players of the 1969 team as on-set consultants as well as 2009 quarterback Colt McCoy. They remained true to the University of Texas Longhorns football program capturing the spirit, excitement and camaraderie with not a dry eye in the house at the end. Freddie Steinmark (Finn Wittrock) played football in Colorado from an early age coached by his dad Fred (Michael Reilly Burke) and encouraged by his mom Gloria (Robin Tunney). They filled their son with confidence to be the best at the sport despite his small size. Although he was shorter than most young men who play the sport, his speed and energy level matched pound for pound even the most potentially gifted players. One being Bobby Mitchell (Rett Terrell) who joined their school from California who Freddie beat in running drills. They become fast friends and later join the UT in Austin team on full scholarships. 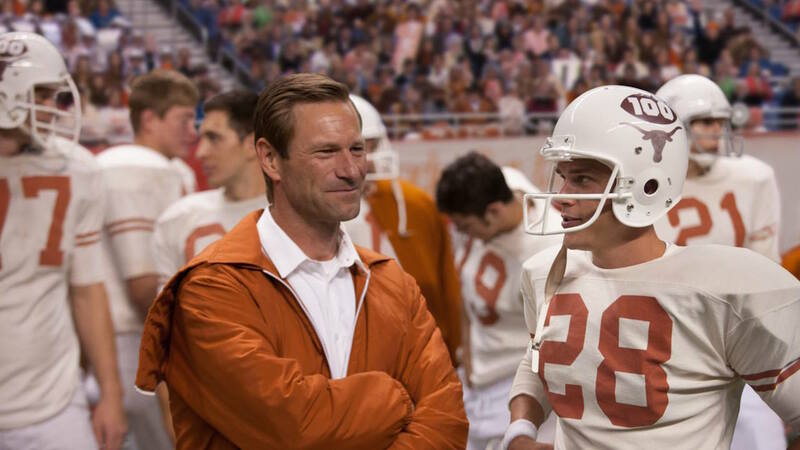 Coach of UT Darrell Royal (Aaron Eckhart) watched Freddie's tapes from high school and was impressed. The young men begin training in earnest to get on the 100 man team after being whittled down from 200. Freddie's high school sweetheart Linda Wheeler (Sarah Bolger) also attends UT. Freddie remains true and steady with her having a strong family and religious upbringing. His sense of center makes him a valuable asset to the team. The coach is so impressed with his work that he makes Freddie the leader of the offensive team. He may be small but he manages to tackle like a freight train. The Longhorns were only 6-2 coming into the new year, and Coach Royal wants to make it to the top. He instigates a new field plan, but team captain and quarterback Bill Bradley is not doing so well and is replaced by James Street (played by his son Juston Street). The team goes on a winning streak. After a couple of years in which we are see touches of history, the Vietnam War, Nixon, and long hair, Freddie perseveres. He works hard at school and on the field. He so full of positivity that even Coach Royal feels good talking to him. It's not long into their latest season that Freddie is feeling pain in his knee. But he soldiers on, wanting to play the big game between UT and their arch rival Arkansas. The coach has to take him out of the game at one point, but lets him in at the end for the win. Then he sends him to the doctor where only bad news happens. The best and the brightest seem to the burn fast and quick. The movie pulls on the heart strings and it's definitely a 5 hankie story. Even if you know that Freddie succumbs to bone cancer, the story of how he got there and the impact he made to the team, his family and friends is raw and inspiring. OK, there are lots of filler scenes with Freddie and Linda making future plans that you know is not going to happen. Religious heavy handedness is in there like a 2x4. But the movie gives life to a little known moment in Texas Longhorn history for football fans it will be a pleasure.